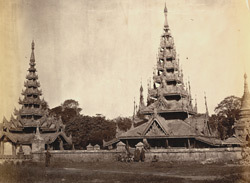 Photograph of pavilions in a Buddhist monastery at Rangoon (Yangon), Burma (Myanmar), part of the Dunlop Smith Collection: Sir Charles Aitchison Album of Views in India and Burma. The print is unsigned, but it was probably taken by J. Jackson in about 1868. Both pavilions are surmounted by multi-tiered roofs that become smaller as they rise, known as pyat-that. The pyat-that demarcate sacred space and the buildings are therefore likely to be shrines or devotional halls. The frontons and eaves of each tier are ornamented with intricate and flamboyant carved work, a renowned traditional Burmese artform. The precise location is unknown.